Jessica Sporn Designs: Fasten Your Seatbelts: It's The Stencil Test Drive! Fasten Your Seatbelts: It's The Stencil Test Drive! Remember the Stencil Girl Products Test Drive I told you about last week? Well, here's the schedule of the fabulous artists who will be in the drivers' seats, taking my stencils around the tracks over the next 7 months! I am linking to the stencils they'll be using, in case you want to buy them to take them for a whirl yourself. If you're playing along, you'll be able to link your work using that stencil, and each of my test drive posts will have a giveaway! Comments and links will be open for one week, and I'll announce the winner after that. More artists may be joining so stay tuned. I hope you'll fasten your seatbelt and play along! The first giveaway starts today! Comment on this post before the end of the day Friday (for Paint Party Friday!) for a chance to win the Hebrew Calligraphy and Hamsa stencil and take a test drive with us on December 6th! Want to join the test drive? Grab the button from my sidebar and put it on your blog. Buy some of the stencils for the weeks you want to play along, and then buckle your seatbelts! "Stop worrying about the potholes in the road and enjoy the journey." 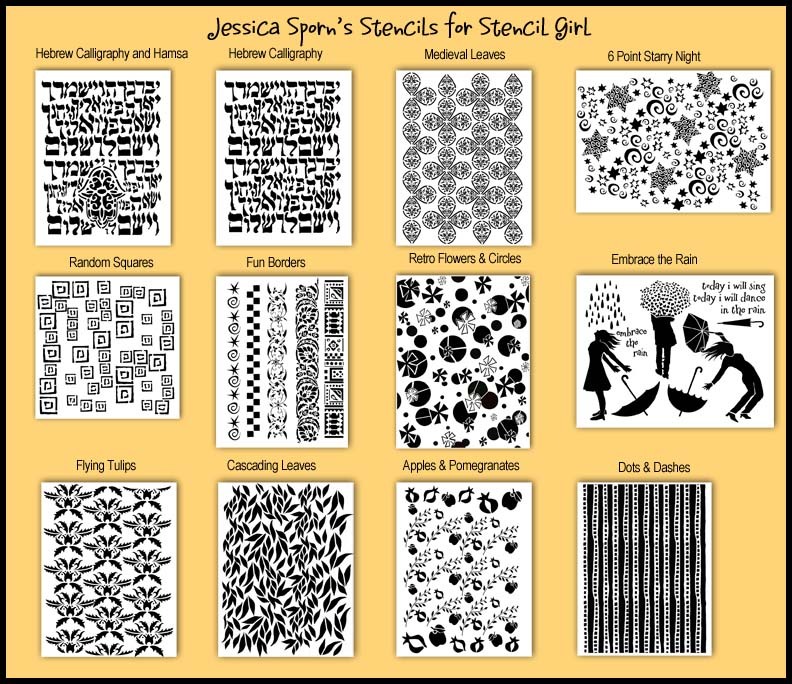 UPDATE: Stencil Girl Products has a great promo - 6 stencils for $75, or individual stencils for $14. Free domestic shipping for orders over $50! Click here for more info. I do follow your blog and find a lot of inspiration! I really like both stencils; I can imagine uses for either one. Lately I am loving borders. So excited for you all to be asked to work with a new musical artist! Trece and Suzieq23, email your snail mail addresses to me at jessicabethsporn (at) gmail (dot) com and I'll get your stencils right out to you! Thank you for visiting and, for my American friends, have a wonderful Thanksgiving. I read and treasure every comment and will answer any questions as quickly as I can. Remember to comment by Paint Party Friday for a chance to win the Hebrew Calligraphy stencil! Your stencils are amazing, well done! PLEASE put my name in the draw for the Hebrew Calligraphy and Hamsa stencil, I have NEVER seen anything like that before! Wow! I love your stencils!! I am new to your site....that must be how I missed the memo to sign up to test drive them. But I'm in it now. Thanks for the opportunity and I will certainly post your button on my blog. Jessica, I'm so happy to finally have a button of yours on my blog and so happy to see all of your stencils in one place! I'm leaving for vacation on Friday but will be pondering which ones to purchase first while we enjoy Disney World! The Hebrew Calligraphy and Hamsa is already on the list as I love the prayer! I'd be honored to win it!! Thanks for the chance!! I am so excited to see what everyone makes with your fabulous stencils! My medieval flower stencil arrived in the mail today...it is even more amazing than I thought and I already love the squares, this is so exciting and I am putting on my thinking cap to create ways to use it that I haven't even thought of yet. Yippee! I hope you do more Hebrew stencils. PS- my daughter is Jessiaa, named after her grandfather, Jesse. Oh Jessica, this is so exciting for you! I really look forward to what people come up with when using your fabulous stencils! Your stencils look amazing!! CONGRATS to the winners!! Loving your new stencils. Would love the opportunity to have one this week. What is a test drive? I must have missed getting around last week. Hi Gloria - basically it's a blog hop. A bunch of artists are going to take my stencils for a whirl, and post about them. There will be a linky list for other artists who want to play along, by purchasing stencils and linking their work. Hope you'll play! Your stencils are beautiful, Jessica, as is all your works. Just a note on the freebie leaves you allowed us to use. I made some copies on glossy photo paper and took them to the nursing home for use in our crafts club there. The residents loved them and used them on collages and greetings cards. A big thank you. Thanks Faye - I am so glad. if you have any photos of the collages or greeting cards, I would love to see them! But it makes me happy knowing they were used. Your stencils look fantastic -- I absolutely love the Hebrew Calligraphy! What a great idea, too, to have a sale linky-link. Thank you!! Love your stencils, I dont use them but will look forward to seeing what others do with them. Maybe I will be converted! Love your stencils, they look amazing. I too love the Hebrew Callifgraphy. Very nice. Thanks. I've received my Fun Borders stencil, and it is just fantastic! More beautiful than I even thought it would be. I can't wait to use it! All the stencils are super awesome! Can't wait to play along! Your new Fun Borders stencil arrived on Saturday and it's already been seeing some ink and modeling paste. Love it. Love the stencils and the whole test drive coming up!! Can't wait to see what amazing works are created. Looking forward to following along! I love using Stencil Girl stencils, too! I've been looking for a good sized Hamsa for a while and would love to win this! Oh Jessica, I think your stencils are just fab! I love using stencils with my fiber work. I'd be happy to win or test drive one any time! Oh wow...just found your blog and this post! I have to play along with this...some of my favorite artists arew here with you...love your stencils!